Each year, many pedestrians in Los Angeles and throughout California and the U.S. are seriously injured or killed when they are struck by motor vehicles. The National Highway Traffic Safety Administration, or NHTSA, reports that 4,735 pedestrians were killed in U.S. traffic accidents in 2013 alone. An additional 150,000 pedestrians were injured and sought treatment during that year. There are many factors that play into pedestrian accidents, including the age of the pedestrian, the lighting, the location of the pedestrian, alcohol use and driver inattention, among others. (NOTE: If you need legal help with an auto v. pedestrian incident where someone was injured or killed in Los Angeles or anywhere in California visit our webpage). The 4,735 pedestrian fatalities in 2013 resulted from a total of 4,653 crashes, some of which caused the deaths of more than one pedestrian. The number of pedestrian fatalities for the year represented 14 percent of all traffic fatalities that occurred. Out of all of the states, California had the highest number of pedestrian deaths in 2013 with a total of 701 people killed. This represented 23.4 percent of all traffic fatalities occurring in the state for the year. According to the California Office of Traffic Safety, 841 pedestrians in Orange County were injured or killed during that year. There are a number of different factors that can lead to pedestrian accidents. The NHTSA data shows that 73 percent of pedestrian accidents happen in urban areas, and 69 percent happened at non-intersections. During the year, Los Angeles had a total of 227 traffic deaths, and 76 of those who were killed in the city were pedestrians. Most accidents occurred in low-light conditions, with 72 percent happening at night. The highest number of pedestrian accidents occurred between 6 and 9 p.m. with the second highest percentage happening between 9 p.m. and midnight. The age and gender of pedestrians are also large factors. Children and the elderly are more at risk of being involved in pedestrian accidents than are people of other ages. In 2013, 21 percent of all children who were age 14 or younger who were killed in accidents were pedestrians. Five percent of all of those who were killed were children, and this age group also accounted for 15 percent of all of the pedestrians who were injured in traffic accidents. Elderly people ages 65 and older accounted for 19 percent of the pedestrian deaths and 10 percent of the pedestrian injuries. More than 66 percent of the total fatalities were male. In 49 percent of the reported pedestrian accidents, either the driver or the pedestrian was under the influence of alcohol at the time of the collision. Of those crashes that were fatal, 15 percent involved drivers who had blood alcohol concentrations of .08 percent or higher. 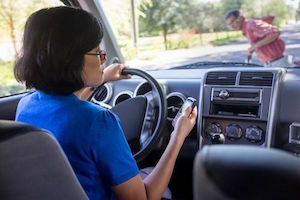 In addition to alcohol use, other driver factors include drivers who fail to come to a stop at intersections, motorists who pass other motorists in crosswalks or intersections, driver inattention due to cell phone use or other electronic device use and others. Some drivers also simply failed to see the pedestrian because of not paying attention to his or her position on the side of the road. It is important for you to do several things if you or a loved one are struck by a motor vehicle. If it is possible, try to not move the victim and call for help. If you are able to do so, collect the names and contact information for any witnesses as well as the make, model and plate number for the vehicle who struck you or your loved one. Make certain to give the police your statement. Be careful to not accept the blame for the accident. Your attorney will help to determine and prove the driver’s liability in order to present a stronger case to the insurance company. Finally, even if you do not initially believe you are seriously injured, you should still seek medical attention and get a thorough examination. Some types of serious injuries, such as those that are internal, may not initially show symptoms. If you or your loved one was seriously injured in a pedestrian accident in Los Angeles, Orange County, the Inland Empire or anywhere in Southern California it is important for you to get the help of a pedestrian accident and injury attorney as soon as possible. An attorney can give you an honest assessment and determine who appears to be at fault in the accident. In many pedestrian accident cases, insurance companies may try to dispute that the drivers were liable even though the drivers caused the accidents. An attorney may be able to use experts and investigators in order to prove the driver’s liability. This can help to maximize your recovery of damages so that you can be compensated for all of your losses, including your medical expenses, wage loss, physical pain and emotional distress. For more information on legal help with any pedestrian accident claim in Los Angeles or anywhere in California click here.